Always an outward-looking, globally-tuned organization, MUTEK was initiated to connect Montréal with international creators and to encourage creativity at home by giving local artists a quality platform for expression and development. The festival’s commitments to networks, interconnectivity and exchange culminate in another strong showing by Canadian and Québec artists at MUTEK Argentina, September 13-16. Thanks to the support of Canada Council for the Arts, Conseil des arts et des lettres du Québec and the Embassy of Canada in Argentina and Paraguay, a total of 14 artists will present 10 performances during the festival. France Jobin, Line Katcho, Magnanime and Sabrina Ratté are also part of the AMPLIFY project led by the British Council. 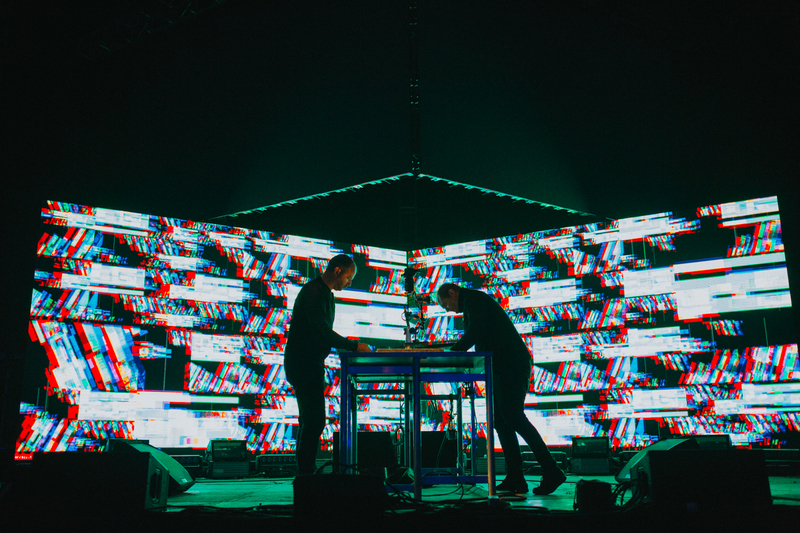 The AMPLIFY network first took place at the MUTEK Montréal festival, from August 20-26, 2018. Participating artists engage in a series of workshops, creative labs, performances and exhibitions, as part of the programming of MUTEK’s Keychange, dedicated to empowering women in digital arts and electronic music to enlighten, embolden and contribute to the current cultural shift around inclusivity and gender issues. Throughout 2018-2019, many of the artists and curators participating in the AMPLIFY program will embark on a transcontinental circulation that will continue in Buenos Aires and Mexico City, finally reconnecting in the UK at Somerset House Studios. A native Montrealer who had spent the 80s and 90s engaged in the fervent experimental music community of this city, Marc Leclair began to gain notoriety during the first edition of MUTEK in 2000 when one of this singles found its way into the hands of Germany’s Thomas Brinkmann. Brinkmann noticed correctly that Leclair’s style had evolved into something utterly distinct, a cut-up, micro-sampled approach to house music that recalled the work of Matthew Herbert as it did the abstraction of Leclair’s homegrown influence, the painter Jean-Paul Riopelle. A MUTEK commission developed with the support of the Conseil des arts et des lettres du Québec, Three Pieces With Titles relies on a new, souped-up, extreme real-time, audiovisual instrument that merges cameras, synthesizers, acoustic instruments, computers, and video projectors. The “three pieces” refer to three distinct movements: the image controls the sound (photographs trigger a camera plus a computer system linked to audio); the sound controls the image (an instrument triggers a camera plus computer system linked to photographs); and the sound is the image is the sound (colour turns into sound, acoustic vibration changes the colour and vice-versa). France Jobin is a sound / installation / artist, composer and curator residing in Montreal, Canada. Her audio art can be qualified as "sound-sculpture", revealing a minimalist approach to complex sound environments where analog and digital intersect. Her installations express a parallel path, incorporating both musical and visual elements inspired by the architecture of physical spaces. Her works can be “experienced” in a variety of unconventional spaces and new technology festivals across Canada, the United States, South America, South Africa, Europe and Japan. With meticulous attention to detail, Line Katcho hybridizes styles, genres and applied tech methods to craft prismatic, enveloping electroacoustic-techno compositions and visual landscapes. Magnanime creates a techno-house hybrid rife with experimental nuances, embracing mistakes of technology and recycling odd noises into her perpetually evolving, beat driven repertoire. Live, her forward thinking production process and enthusiasm for listener’s reactions shines, aware of her environment she manifests a dance music experience that is always an exchange with the audience. Style: Deep, dubby atmospheres and motorik movement, bent vintage synths; video signal analyzing experiments, layered abstract geometries. Bolstered by a community of harmoniously experimental artists in Montréal, Simon Chioini creates a hybrid of new music compositions and genre fusing underground club sounds – acoustic instrumental flourishes and synth waves layered in syncopated rhythms and unexpected distortions. After completing a degree at the Conservatoire de musique de Montréal, Félix Gourd changed his practice towards visual production. His versatility has lead him to work with many local musicians, as well as international pop stars Britney Spears and Selena Gomez, alongside his established collaboration with Simon Chioini. 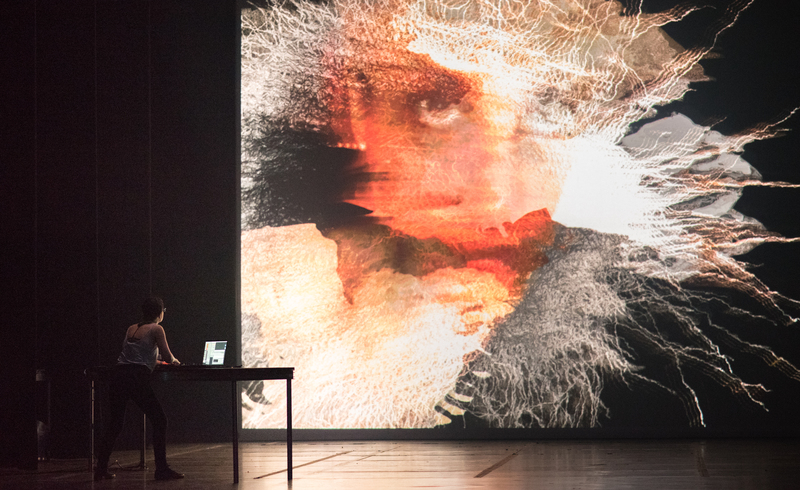 Ratté performs Machine for Living, an immersive project combining video, sculpture and live performance alongside a soundtrack by Roger Tellier-Craig. Machine for Living investigates the 1960s architecture of towns and brutalist habitation buildings outside Paris, combining documentation and abstraction in utopian and dystopian atmospheres. followers all over the world. Since 2005, Lemieux has been expanding into music production through collaborations with Guillaume Coutu-Dumont (as Flabbergast) and Stephen Beaupré (as Brandy Snifter). This initiative was made possible thanks to the financial support of the Conseil des arts et des lettres du Québec and the Embassy of Canada in Argentina and Paraguay. AMPLIFY is led by the British Council, MUTEK festival and Somerset House Studios. In Buenos Aires, Amplify is supported by SKYY Vodka.